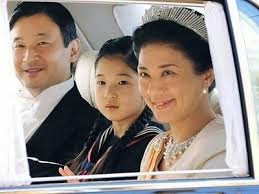 Historically Japan had allowed female succession to the Chrysanthemum thrown however this all changed with the Meiji restoration when a law was enacted restricting the throne to male heirs only. This was then tightened post war to allow only male heirs from close relatives. No more third cousins twice removed. In 2006 this became a problem. There were no more male heirs but there were several female heirs who would have succeeded had the law not been changed. The debate started to really get heated when the Emperor's second son announced they were expecting a baby. If it was a girl then Japan would have to change the law, but how? Should the laws be loosened to allow more distant relatives and a male heir be found or should the change allow for female succession. The country was split though a majority favoured female succession. The debate became even more heated. On 6 September 2006 the country held its breath. Would it be a boy or a girl? It was a boy. Immediate crisis over, proposed law for female succession shelved. But it will be back, Japan will need to face the decision one day.